Wilderness Guide, Rustic Furniture Builder, Dog Sled Builder, Etc. Etc. Etc. "Jack of all trades type". I also do a little free lance writing. Anything to keep from getting a real job. I am 43 years old. I have a B.S. degree with a double Major in Wildlife Management and Parks and Recreation from Central Michigan University. I am an Eagle Scout, a former college and semi pro linebacker and H.S. football coach. 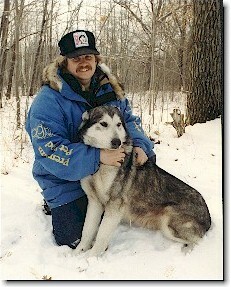 My wife Cathy and I have been involved in sled dogs for 12 years. and have lived in the Upper Peninsula of Michigan for 4 years. We own and operate Wolfsong Outfitters Dog Sled Adventures. We have also offered Guided Horseback riding trips up until now. Currently I build Rustic Cedar Post Furniture, and also build Economy dog sleds for Frank Hall of Hall's Sleds. Cathy has a Masters degree in Counseling and is presently working toward a Veterinary Technician Certificate focusing on Holistic and Alternative practices. I am a Director at Large of the Michigan Sled Dog Association (the organization that was formed and led the fight against banishment from Michigan trails by snowmobilers and the Michigan DNR), and a member of the Great Lakes Sled Dog Association. As I have already mentioned we run a touring business, running approximately 60 trips per season. We run hour rides, half day trips, whole day trips, and overnight winter camps. We currently have 43 Alaskan Huskies in our yard, along with 3 cats and 2 horses. All of our dogs run tours but approximately 24 are also race dogs. Even though touring is our main business, I also run distance races such as Beargrease, UP200, and this year Can/Am 250 in Maine. While running tours is better than any job I have ever had, (and you can about name it and I've done it), I really enjoy distance racing. There is nothing like being on the trail for days at a time behind truly incredible athletes. I believe that you really get to know your dogs in a distance race. You have to care for and understand each individual dog to truly become a unit out there. Early in my mushing career I had a very wise and experienced musher tell me " you're not really a Musher until you've run at least a 150 mile race", (no offense to sprinters or recreational folks,,,***S***). That stuck with me. Even though I drove dogs for a living, I never really felt like a musher until I crossed the finish line of a 200 miler. Our ultimate goal is to run Iditarod 2000. I have been dreaming, planning, and talking about running Iditarod since I got into dogs. I finally made the decision in 1997 to run the 2000 race. So everything we have done since then is geared toward that end. Well, I'm old enough to remember Sergeant Preston Of the Yukon, so I guess that's what ignited it, but I really believe that each of us that get into sled dogs has a long forgotten hunger for wildness and adventure buried deep in our souls that originally drew us to the sport. My first solo run was with 6 borrowed dogs. My leader was a pure white Siberian named Arctic. He was a great leader but a cantankerous SOB. Every time I gave him a command he turned around and growled at me. We got where we were going but I was pretty intimidated by my lead dog knowing more than I did. My first lesson from sled dogs.....humility. I have learned something from almost every musher I have ever met. I believe that if you ask 10 mushers the same question, you'll get 10 different answers. So I'm kind of a picker. I picked up this from that person, and that from this person until I felt confident enough to find my own style of driving, dog care and racing. In other words there is not just one way to do things. Take what you like and leave the rest. I also believe that with this sport you need to keep an open mind. You can only take your dogs to YOUR limits of knowledge regarding training, care etc. You can ALWAYS learn something new. We run a kennel of 43 dogs, approximately 24 are race dogs, the rest are strictly touring dogs. At this time we are feeding Eagle Power Pack to our race dogs and Eagle Hi-Ration X-Tra to our tour dogs. We feed dry with water on top of the kibble. We also give baited water in the morning year round rather than free choice. This teaches the dogs they have to drink when it's put in front of them. Very important when coming into a check point. We may add a noon and evening watering when it gets really hot. We do that until we start training fairly hard then add corn oil and meat. Each dog receives approximately 3/4 of a pound of meat (1/2 ground beef, 1/2 Eureka mix). When we add meat, we mix that with hot water then pour it over the kibble. I also like to use a little zinc sprinkled over the food if I can get it. When we are training hard or racing I like to snack the dogs a lot. We use salmon, turkey fat, heart-lung-liver mix, liver, or beaver for that. I also like to make up ice cube snacks for warm days or long stretches on the trail. I boil up a bunch of salmon, add water then freeze in a 2x2foot tub approximately 2" thick. Then we cut this into 2"x2" squares on the band saw for snacks. We do the same with liver except we don't cook it, just add warm water to draw the blood out and freeze. The dogs really love these "popsicles" and it's a great way to keep them hydrated on the trail. Last year at the UP200 it was 52 degrees when we finished and my dogs came in in great shape. I guess our style is like a lot of folks. Take the best care of your dogs as you possibly can. If there's a choice between whether you buy dog food or pay the phone bill, there's no choice, you buy dog food, right? Besides, I always thought you only had to pay the pink phone bills anyway. Seriously though, we keep our dog yard clean, scoop daily etc. etc. This gives us a chance to play with and kind of give each dog the once over every day. I try to "read my dogs" even in the yard. What's their coat like, their attitude, feet, etc. etc. You can tell a lot about each dog from just daily interaction with them. All of our dogs are on 5 1/2' chains on 4' cedar posts. These keep the chains off the ground and basically safer for the dog. Keeps the snaps from wearing faster also. Some of the posts are situated so dogs can touch each other and some aren't. It depends on the individual dog on where they are placed. Some of our dogs get depressed if they don't have a playmate. Some it doesn't matter to them. We use 55 gal. plastic barrels for houses on 10-12" "bunks" that keep them off the ground. Winter time we try to give them fresh straw weekly and keep the entrances to their houses clear of snow. We also have a couple of pens for puppies or females in heat. Last year we added a series of outdoor halogen lights to the dog yard. We run right out of our yard so it makes it really nice for hooking up for night runs or feeding if we get back from town after dark. As I already mentioned, we run Alaskans. Our first dog was a Siberian. We named her Serenity,,,never had a bit of it until we finally found a home for her. I guess that's why we run Alaskans***G***. While I truly admire people that have the patience to run Sibes, I prefer the toughness of Alaskans. I know.....some Sibes are tough too. This is an area I guess I don't get too worked up over. I have my preference as to how I would like a dog to be built, but I haven't found the perfectly built dog yet. I like dogs that are a little bigger and leggier, but I also have some excellent dogs in my yard that are short and light. My up and coming star leader is a 30lb. female that has a really weird build, but she is smart as a whip, tough as nails and has the sand in her to go the distance. I know there are some physical standards that can make a dog move more efficiently, or faster, or have a smoother gate, but I haven't found that all of those things are more important than their head. I prefer calm dogs. We work a lot of control in our training program. I like dogs that are intelligent, friendly and respond to me quickly. I believe that a dog that responds quickly to you, regardless of what you are trying to teach it, makes a better dog on the trail. I never have liked "High Attitude" dogs. I guess I don't believe that attitude = speed. I have some very calm dogs in my yard that just sit or lay down at hook up until I say "all right," then they go like crazy. If a dog is a lunger, or line chewer or just hyper at the line or stops, we first try and train them to be calm, if that doesn't work we try to sell or find a home for them. Would you ask a mother which of her children is her favorite? There have been a number of very special dogs over the years. I'm not a geneticist, so I don't really have any "criteria." Over the years we have had some very good dogs come from some very average parents so I really couldn't give you any answers to that. Basically, right or wrong, we try to breed the best to the best. Our breeding program isn't very scientific, but we've been relatively successful. We've had very few pups that didn't want to be sled dogs. Not really. I've tried to do that in the past and it didn't work. Pups that I thought wouldn't work out turned into excellent dogs. Now our pre-training evaluation amounts to....patience. We start "training" our pups the day they are born. We do A LOT of socialization with our pups. We not only handle them frequently, but we ask visitors to also. We've had pups come from very shy mothers that were as friendly as can be. We also like to do a lot of puppy walks, teach them to trust us and have fun when they are out with us. We teach them "NO" fairly early, and "BACK" to move away from the puppy pen gate, and "DOWN" to keep them from jumping unless we ask them to. This carries over to feeding or scooping as adults. I guess we try to expose the pups to as many different things as we can without scaring them. One thing I do that I haven't seen anyone else do, is after they are weaned, I drive the 4 wheeler up to the pen and sit on it running while talking to the pups. They may shy at first but eventually get used to it. Gradually I rev the machine as I'm talking and playing with them. The result of this is we have never had a pup harness break that was afraid of being in front of the 4 wheeler. When we do harness break pups, we only put 2 or 3 in a small team at a time. These runs are designed strictly for the pups. They are hooked next to an older, calm dog. I have found that if I hook pups next to a calm dog, they tend to calm down faster than if they are hooked next to a real excited dog. Pups tend to learn an awful lot from their running partners. We don't push them, we go very slow to let them figure out what is happening and that it's kind of fun to run along. We don't care if they are pulling or not at this point, just that they are not scared or fighting it. We will stop several times on this initial short run and praise and really fuss them up. They are not only learning to pull, but to be calm at stops and what "whoa" means. Fortunately, using this method, we haven't had a pup that wasn't pulling hard by the third run and asking for more when they got in. What is the most important thing you look for in a young pup? Responsiveness first. Like I said I like dogs that respond to me quickly. Also, curiosity, are they out exploring their surroundings etc. With shy pups we spend a lot more individual time with them, maybe bring them in the house etc. I believe there is a major difference between "training" and "conditioning". I see many, many, mushers that just basically condition their dogs. I like to believe that we "train" our dogs. By that I mean we "teach" them what it is we want them to do, then use repetition, or heaven forbid, discipline, to get them to do it when we ask for it. By discipline I do not mean punishing a dog for doing something wrong. It is a training tool to get them to do something "right", (the response we are asking for). As soon as they do it right, we use a lot of praise and fussing. Dogs as a general rule want nothing more than to please you. But, they have to "understand" what exactly you are asking them to do. I previously mentioned responsiveness, and "reading" dogs. I believe I need to be able to read my dogs so I can figure out what works best for that individual to "understand" what I am asking. Just like people, some dogs respond to discipline, some respond to praise. We do MUCH more praising than disciplining. Repetition is also very important. If that means stopping 8-10 times in a 2 mile run to get them to be calm at stops then that's what we do. If that means walking the length of the gangline 10 times to get a leader to "line out" or "hold tight", that's what we do. If that means stopping 20 times in a quarter mile to train them to "gee over" then that's what we do. The hard part of our training, is training ourselves to be patient, observant, positive, and open minded. We do a lot of individual leader training walks to teach commands. We also don't run any neck lines on our leaders. Young leaders seem to pick up commands much faster using this technique. Many of the training techniques we use I learned from training with Jamie Nelson. I would HIGHLY recommend her training school or "Boot Camps" to anyone, regardless of their prior experience. I would say the most important training goal for me is control. By control, I mean a dog team that responds to me. A team that is calm at hook ups and stops. A team I can stop on the trail and calmly walk up to undo a tangle or replace a bootie with out worrying when they will pull the hook. (In our touring business, I sometimes have to leave my team to help a customer behind me. I want to be relatively sure they will still be there when I get back). A team I know is strong enough to break a cable gang line, but won't because they are trained not to. While fall training, I will often physically stop and hold the team on a fairly steep downhill grade. This teaches them to stop when I want them to. It's saved my bacon several times when I tipped the sled over going down hill. For me High Attitude teams are too stressful. I don't like to worry all the time. I see a lot of mushers that basically run dogs "scared", (not the dogs, the mushers). By that I mean they are always afraid of breaking lines, losing teams, getting dragged etc. etc. (don't get me wrong, I always keep those things in the back of my head). While that certainly adds to the "adventure" of running sled dogs, that's not fun for me. If I'm nervous, tense, scared, my dogs pick up on it. If I'm calm and positive, they pick up on that too, and I believe it makes it more fun for them. Control, and response, see above. Like I said, right now our goal is Iditarod 2000 so every race we run is to gain a certain type of experience for me and my dogs. and bleeding, I lost time looking for missing trail markers and spent 14 1/2 hours on the trail and I took a swim in the creek, but I worked really hard to stay positive. Another thing I am big on is courtesy to other mushers, trail help, and check point volunteers. I always thank trail help when I go by them, just for being there. I also try to thank check point volunteers and vets for their efforts. Do you having a mushing career goal? Don't have a clue. The way I look at it, if a person has the courage and determination to train and race and finish ANY distance race, that person is a winner. I believe the future of the sport is exceptional. In spite of all the efforts by the animal rights yahoos, we are seeing dog teams everywhere, in magazines, on TV, in movies, even on David Letterman. The general public is fascinated with these incredible athletes, and that's SUPER. Add to that the progress that's been made in dog care and health and nutrition, it just keeps getting better and better. The ISDVMA has done some tremendous work along with organizations like MUSH WITH PRIDE and FOND, not to mention the individual clubs promoting the sport. We just need to keep our side of the street clean, take the best care of our animals that we can, police ourselves, and fight when we have to, and Mushing will continue to grow. TAKE CARE OF YOUR DOGS. Remember, the dogs are the drawing card, but many, many of the general public are not only drawn to the dogs, but also to our lifestyle. When a non musher talks to me, they believe they are talking to all mushers. If they like what they see in my dog yard or on the trail, that will have a definite impact on what they think of you when they see you. Keep that in mind. Please. I belong to several organizations and I believe they are very important in the development of the sport. Particularly when it comes to education of non or new mushers. I also believe that mushers as a general rule are very individualistic. That's what I like about the sport, it's just me and my dogs out there. So I guess in my opinion, we need to find the balance between the two. GO SLOW. Learn as much about dog care, and nutrition, and racing, and touring, and feeding and equipment and etc. etc. etc. as you can--from as many mushers as you can--before you jump in with both feet. Make some choices on what kind of dogs you like, what kind of mushing you want to do, how many dogs you can afford to take quality care of, what kind of truck you can afford, where you want to move to up north that can support your lifestyle....and addiction to mushing. (I'm serious....that'll come***G***) Then GO FOR IT!!!!!! There is NOTHING like driving sled dogs. You really don't want to get me started story telling. There'd be more pages on the Net than the Clinton impeachment papers. You'll have to come and sit by the campfire some night. Any additional comments about sled dog sports? I guess the thing I love about these dogs is that they are truly REAL. There are no pretenses with them. They like you or they don't. They're happy or they're sad. They play, and they fight, there is no difference to the two. They truly have balance. That's what I strive for in my life. I guess I want to conclude this considerably winded interview by relating some of the things I have learned from my dogs. I have learned patience, and tolerance, and courage. I have learned humility, and confidence, and peace. I have learned trust, and dependence, and independence. I have seen through them, in me, compassion, hurt, fear, toughness, excitement, anticipation, joy, awe, love and serenity. I believe these dogs have a spiritual understanding we humans can't even comprehend, and I am grateful to God that he has seen fit to let me be a part of their lives, and they mine.